Two days after California utilities PG&E and Edison crashed, losing a third of their market cap in 48 hours amid investor fears over their exposure to the devastating California fires which are still raging, moments ago PG&E stock tumbled over 20% in premarket trading after the company disclosed it has fully drawn down its revolving credit facilities, in anticipation of soaring liquidity needs. In an 8-K filing this morning, PG&E and its subsidiary, Pacific Gas and Electric Company, announced they had drawn the full $3.3 billion available to them in aggregate borrowings on their revolving credit facilities as of November 13. With these borrowings, PG&E Corporation’s and the Utility’s balance of cash and cash equivalents increased to approximately $356 million and $3.1 billion, respectively, at November 13, 2018. PG&E Corporation and the Utility made the borrowings under their respective revolving credit facilities for greater financial flexibility. PG&E Corporation and the Utility plan to invest the cash proceeds from the borrowings in highly liquid short-term investments and to use them for general corporate purposes, including upcoming debt maturities. California authorities have been investigating PG&E equipment as a possible cause of the deadliest wildfire in state history, burning about 150 miles (240 kilometers) northeast of San Francisco. The blaze has killed at least 48 people and destroyed 130,000 acres. 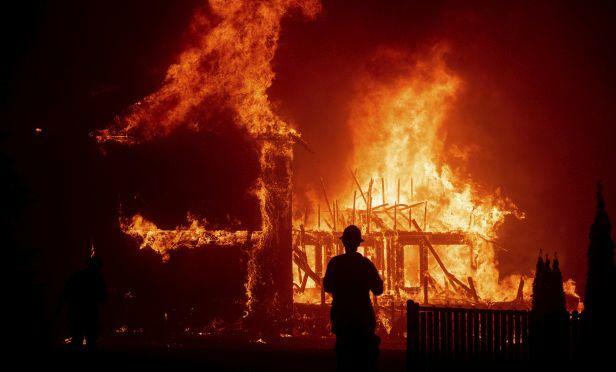 On November 8, 2018, a wildfire began near the city of Paradise, Butte County, California (the “Camp Fire”), located in the service territory of the Utility. The California Department of Forestry and Fire Protection’s (“Cal Fire”) Camp Fire Incident Report dated November 13, 2018, 7:00 a.m. Pacific Time (the “incident report”), indicated that the Camp Fire had consumed 125,000 acres and was 30% contained. Cal Fire estimates in the incident report that the Camp Fire will be fully contained on November 30, 2018. In the incident report, Cal Fire reported 42 fatalities. The incident report also indicates the following: structures threatened, 15,500; single residences destroyed, 6,522; single residences damaged, 75; multiple residences destroyed, 85; commercial structures destroyed, 260; commercial structures damaged, 32; and other minor structures destroyed, 772. While the cause of the Camp Fire is still under investigation, PG&E warns that if its equipment is determined to be the cause, "the Utility could be subject to significant liability in excess of insurance coverage that would be expected to have a material impact on PG&E Corporation’s and the Utility’s financial condition, results of operations, liquidity, and cash flows." Susquehanna estimated Monday that the fire, which wiped out the town of Paradise last week, could cost PG&E as much as $5 billion. PG&E already faced up to $17.3 billion in potential liabilities for 2017’s Northern California wildfires, according to a JPMorgan Chase & Co. estimate. Those blazes killed 44 people. The news sent PG&E stock plunging another 20% this morning, sending it to the lowest level since 2003.